While booking flights from New York to Stockholm, it came down to two choices. 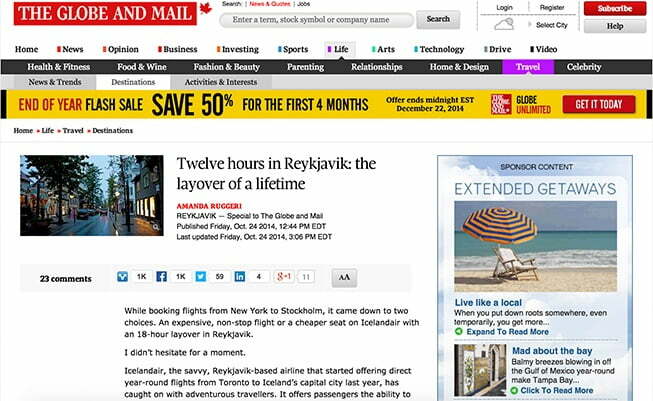 An expensive, non-stop flight or a cheaper seat on Icelandair with an 18-hour layover in Reykjavik. I didn’t hesitate for a moment. Icelandair, the savvy, Reykjavik-based airline that started offering direct year-round flights from Toronto to Iceland’s capital city last year, has caught on with adventurous travellers. It offers passengers the ability to take layovers in Iceland for up to seven nights – at no extra charge – while en route to London, Paris, Amsterdam and a host of other European destinations. Last month, they launched their #mystopover campaign – complete with surprising one passenger with a 48-hour tour of the country. But for those of us who aren’t lucky enough to get a surprise package tour, and who don’t want to take a week (or even a full day) away from trips we’ve already planned, a shorter layover in Reykjavik is still worth it. Thanks to the capital’s size (it’s home to about 120,000 people) and compactness (most of the main sights are within easy walking distances in the centre), it’s easy to get a real sense of the city in even a half-day layover. Just be prepared: You’ll want to come back. Got 12 hours in Iceland? Here’s how to make the most of your layover. Layover is a short stay somewhere between two parts of a journey. 1. We had a two-hour layover in Denver yesterday. 2. Our flight from New York to San Francisco made a layover in Chicago.